More than 1,360 Jersey Mike’s locations across the country are joining forces with more than 170 local charities for the company’s 8th Annual Month of Giving fundraising campaign. Last year’s Month of Giving raised more than $5.5 million for local charities nationwide, and this year Jersey Mike’s wants to break last year’s record-setting total. The campaign culminates in the nationwide event, Day of Giving, on Wednesday, March 28, when local Jersey Mike’s owners and operators will donate 100% of sales proceeds their designated non-profit partner. 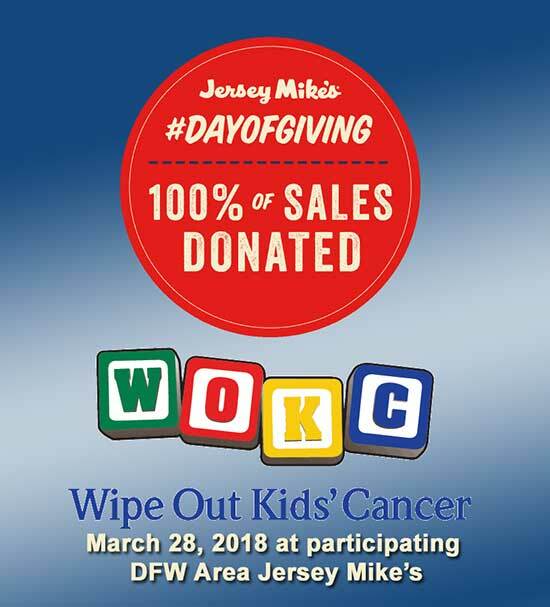 DFW area Jersey Mike’s are supporting Wipe Out Kids’ Cancer, a non-profit organization dedicated to raising awareness and funding for pediatric cancer research. Eat at a participating DFW area Jersey Mike’s on Wednesday, March 28th to support pediatric cancer research. 100 percent of the day’s sales from DFW-area Jersey Mike’s locations will go directly to Wipe Out Kids’ Cancer. Catering and take-out orders count, too! And, don’t forget, you can donate to Wipe Out Kids’ Cancer all month long. For a list of participating restaurants in your area, please visit www.jerseymikes.com/mog. Everyone is invited to visit a Jersey Mike’s restaurant and enjoy a delicious sub meal.